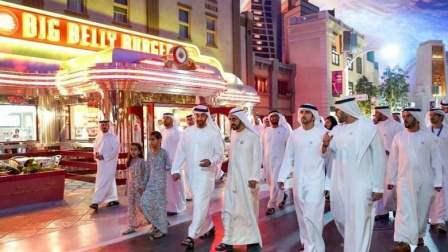 The Dubai Ruler and Abu Dhabi Crown Prince came together to inaugurate the $1 billion Warner Bros. World Abu Dhabi on Yas Island on Monday. The grand opening of the world's largest Warner Bros. branded indoor theme park, however, is on July 25. His Highness Sheikh Mohammed bin Rashid Al Maktoum, Vice-President and Prime Minister of the UAE and Ruler of Dubai, and His Highness Sheikh Mohamed bin Zayed Al Nahyan, Crown Prince of Abu Dhabi and Deputy Supreme Commander of the UAE Armed Forces, were briefed about the park as they toured it. Following the tour, Sheikh Mohammed bin Rashid posted photos of the opening and tweeted: "With my brother Sheikh Mohamed bin Zayed while launching the Warner brothers World Abu Dhabi - a new milestone in our capital ... a new destination for our families and a key hub to boost the tourism sector for our national economy." Sheikh Mohamed bin Zayed also took to Twitter to announce the opening. "We are developing the tourism sector to position the UAE among top global destinations for family entertainment and leisure," he tweeted. Warner Bros. World Abu Dhabi will bring to life fan-favorite DC Super Heroes like Batman, Superman and Wonder Woman, alongside beloved animation characters like Tom and Jerry, Scooby Doo and The Flintstones, using state-of- the-art technology to create immersive environments and experiences. When the highly-anticipated theme park opens its doors tomorrow, guests will be transported to six designed lands including DC's Metropolis and Gotham City, as well as Cartoon Junction, Bedrock, Dynamite Gulch and Warner Bros. Plaza. In addition to its many grab-and-go and sit-down options, the park is the first in the region to offer guests a chance to enjoy a personal visit to their table from some of their favorite characters. The 1.65 million sq. ft. park is developed by Miral to complement its Yas Island destination portfolio of themed parks. This includes Ferrari World Abu Dhabi, Yas Waterworld, CLYMB and SeaWorld Abu Dhabi, which will open in 2022.